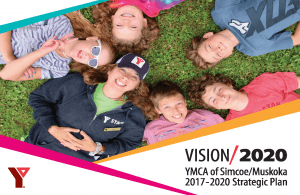 In 2012 the YMCA of Simcoe/Muskoka engaged 1,300 stakeholders in the development of a five-year Strategic Plan: My Y for Good. That plan was based on achieving the following Strategic Directives: My Y Opens Doors, My Y Inspires Youth, My Y is Strong. Vision 2020 is an extension of My Y For Good, addressing the needs of our community today and planning for the future. It builds upon the same themes, with a shift to reflect the work the Y does to strengthen families. Vision 2020 focuses on the following priorities: Philanthropic Development, Organizational Culture and Capital Investment. By concentrating on these areas of focus, My Y will improve the quality of health for children, youth and families, instill a sense of community belonging for all and make certain that My Y is a community partner for life.